Gallia Academy senior Jason Stroud, seated second from left, will be continuing his wrestling career after signing with Lourdes University after signing a letter of intent on Monday, April 8, 2019, in the GAHS library. Joining Jason at the table are parents David and Marica Stroud, as well as brother Shane Stroud. Standing in back are GAHS Athletic Director Adam Clark, Lourdes wrestling coach Dock Kelly and GAHS wrestling coach Todd May. CENTENARY, Ohio — Rewards don’t often come easy. 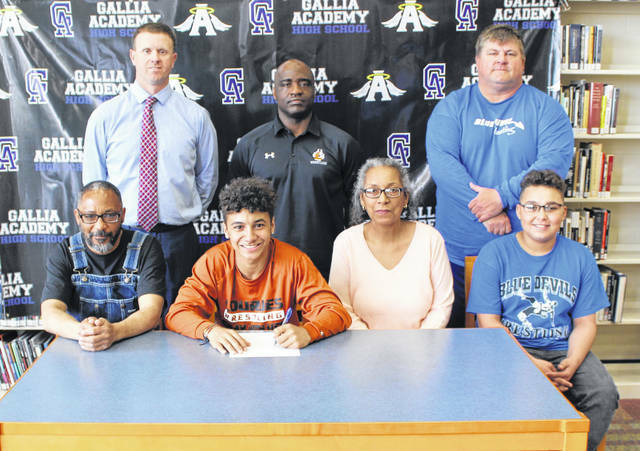 Jason Stroud completed a long journey while reaching a lifelong dream on Monday, May 8, 2019, when the Gallia Academy senior agreed to continue his wrestling career with Lourdes University during a signing event at the GAHS library. Stroud — a four-year varsity letterwinner in wrestling — was a three-time All-Ohio Valley Conference champion and two-time Division II district qualifier during his tenure with Blue Devils, amassing over 20 wins and an 84-43 overall record during his final three seasons in the Blue and White. Stroud is one of only a handful of Gallia Academy grapplers to partake in the program’s four consecutive OVC team titles, and the senior has played a vital role in helping GAHS bring home crowns the last three seasons. Stroud, however, notes that this moment in time wasn’t even a thought just four years ago, especially after a rough introduction to varsity competition his freshman season. But, over time, Stroud started finding his way on the mat … and the confidence grew from there. Later came the passion, then the extra work. And now, an opportunity to be a member of the Gray Wolves. Stroud battled through some injuries his senior year, which led to a 21-18 mark that ended at the D-2 Heath district tournament. His junior year, however, Stroud went 37-11 while winning his second straight OVC title and qualifying for his first district tournament. GAHS wrestling coach Todd May believes that Stroud is one of the most coachable grapplers that he’s ever had, and the third year mentor also believes that Stroud’s willingness to let coaches make him better is the best attribute he has headed into collegiate competition. Lourdes University is located in Sylvania (OH), a suburb of Toledo on the northwest side. It is a private Franciscan school at the NAIA level that competes as a member of the Wolverine-Hoosier Athletic Conference. Stroud — who carries a 3.0 grade-point average — plans to major in business while at LU. Besides the extended opportunity to compete, Stroud fell in love with the location of the school — as well as its rich traditions. It also helped that a former teammate and close friend, current LU sophomore Hunter Jacks, will be there to help with the transition process. In all, Stroud felt it was the perfect fit for him moving forward … and he’s looking forward to getting started. “It’s in a city, and that’s something that I’ve always wanted to do. I love Gallia County, but I want to be in a city and experience something new. It’s not too big and not too small, and I have an old teammate up there in the program already — so I have a little bit of support system in place,” Stroud said. “The school was impressive, plus the coaches and team members were very easy to get to know and get along with. The program is growing and getting bigger and better every day, and I’d like to be part of that process over the next four years. Stroud is the son of David and Marica Stroud of Gallipolis, Ohio.